ASFC-1209 represents Flow indicator/totalizer/transmitter for flow applications related to any GAS flow. The instrument is designed to accept 3 inputs of FLOW, PRESSURE and TEMPERATURE at a time. 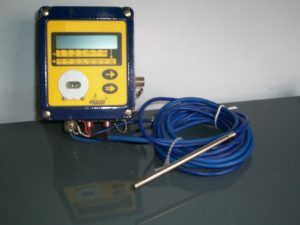 Based on these inputs instrument have in-built automatic computations of Density of the gas and other fed in parameters, the instrument calculates the instantaneous flow rate. This Calculation totally compile with AGA3, Nx19. This flow computer can be easily interfaced to PLC, SCADA or DCS systems as various options like analog retransmission and RS232/485-MODBUS or GPRS/GSM connectivity And SCADA OFFERS more flexibility and enables remote monitoring. Display models are available with weatherproof &flame proof endosome as an optional feature.